This weekend Matt and his dad went to pick up breeding stock. 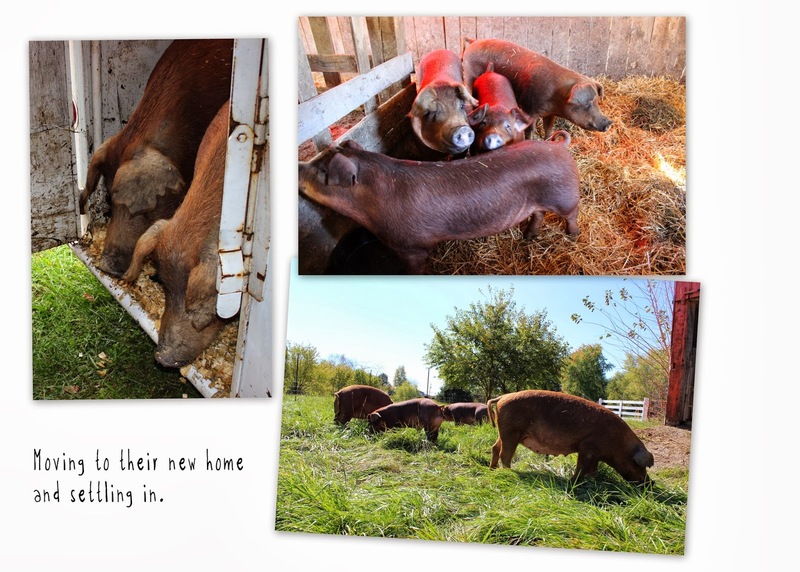 We now have one boar and three bred sows. We could conceivably have 35 pigs and piglets by February! After much searching, a trip to Illinois and another to Kentucky, we finally found our breeding stock. Along the way, we seriously considered several breeds: Red Wattles, Gloucester Old Spots, Herefords (aren’t those cows with red bodies and white heads? Yes, but there are also pigs with red bodies and white heads. ), and lastly the old-line Durocs we purchased. So why Durocs as opposed to the other breeds mentioned? There is always a story. We happened onto the Durocs through a chance meeting at a local farm tour. Local restaurants were offering some tastings and one in particular had some awesome pork. Beautifully smoked, amazing marbling, and phenomenal taste. It was like nothing we had ever tasted before. A little conversation with the chef and we learned it was a heritage breed of pork. We had mentioned our business plans and a couple weeks later Matt had a meeting with the chef. They talked for an hour or so and after much discussion Matt was given the name of the breeder where this chef purchased hogs for his restaurants and catering business. Matt called the breeder and within a week he and his dad were off to Kentucky. This visit was very different from the trip to Illinois. When they went to Illinois, it was a farm that was open to the public and frequently had tours. This Kentucky farmer was very serious about biosecurity, and asked that they wear shoe booties and bunny suits! The getup was worth the hassle because the hogs were awesome. While there, they worked out a purchase agreement. So here we are today, less than one month after that chance meeting, we are proud to welcome our foundation breeding stock to Fork Right Farm. All are registered with the National Swine Registry, and will make for a good foundation to start our herd. Meet 10-1 our boar, 4-12 a gilt recently bred to 10-1, 12-11 and 15-10, experienced sows bred to their former owners herd boar. Did your eyes just glaze over like mine when Matt shared this information? These piggies need better names! I’m looking for suggestions. Ideally there will be a theme among the names. Post your ideas in the comments section! We can add to that sagely advice and celebrate the silver lining…we will have our first saleable products as soon as 6 weeks after the piglets are born, which would be around Christmas or the first of the year. We will offer to sell a select number of barrow feeder pigs (the castrated males) which could work out for local 4-H fairs. Contact us if you are interested. 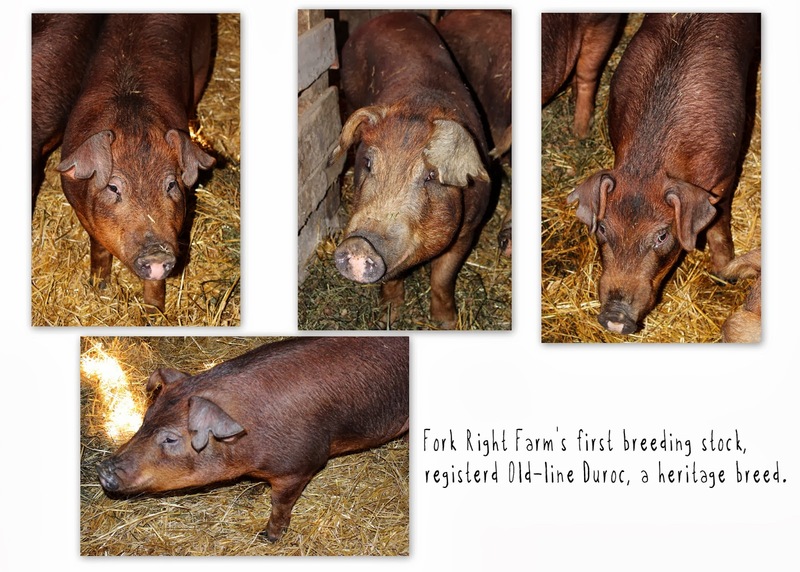 Our first meat hogs should be ready to sell in June. More information on that will be available soon. Sign up for our e-mail list and we will send you all the details as soon as we have them! Be sure to like us on Facebook so you hear when our first piglets arrive! Ok...I didn't understand most of that, but sign me up for some bacon! Great blog and yeah for you guys! there is nothing better than Heritage pork raised the right way. Your customers are in for a real treat. Keep up the blogging and the hard work of family farming. Well done! Love my farmers.......keep us posted on progress. I can pick those genetics out of a lineup any day......Old line durocs are amazing now you need a Hereford Boar mutts make yummy bacon!